Extend the goodness from your garden with colorful and crunchy homemade pickled vegetables. This quick and easy pickled vegetable recipe requires no canning procedure and can be made with your choice of garden-fresh green beans, okra, cauliflower or baby carrots. 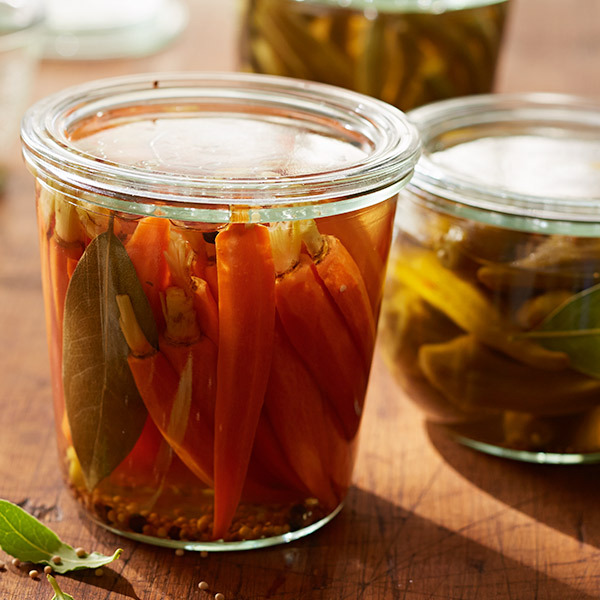 A hot and sour brine is used to marinate the vegetables, and in a couple of days, your pickled veggies will be ready to enjoy as an appetizer or side dish. Pack your vegetables of choice tightly in a 1 quart glass jar, leaving ½ inch of room at the top. Set aside. Toast the mustard seeds and peppercorns in a small saucepan over medium heat until fragrant, about 2 minutes. Add remaining ingredients, and stir until the sugar is dissolved. Bring to a boil. Immediately pour the brine into the jar, making sure to cover the vegetables completely. Allow the mixture to cool to room temperature, about 1 hour. Seal the jar with a tight-fitting lid and shake or rotate it to evenly distribute the brine and spices. Store in the refrigerator for at least 1 day and preferably 1 week. The pickled vegetables can be kept refrigerated for up to 1 month.